Add a seasonal green flourish to your front door or festive decorations this year with a beautiful wreath made from natural materials. Forage in your garden and hedgerows to see what you can find, then follow our step-by-step guides for creating three very different wreath designs. Whether you prefer the more traditional evergreen Christmas wreath with its festive smell and red berries, an artful (yet deceptively simple to make) creation including moss and colourful peppercorns, or a super stylish living wreath made from succulents, find one to suit below. If, even though you have the best intentions, you just don't have the time to make your own, take a shortcut and select the best Christmas wreath from our buyer's guide to the best designs available. This wreath makes the most of seasonal and evergreen foliage, with colour and scent from berries and oranges. 1. Bind generous handfuls of moss on to the wire wreath frame with mossing wire. To do this, fasten one end of the reel of the wire to the ring and wrap around the moss in a circular fashion, keeping it taut, and adding handfuls of moss until well covered. 2. Add seasonal foliage (such as Eucalyptus cinerea and Skimmia japonica, but you can use holly or other greenery), by pushing the ends deep into the moss base, working to roughly a 45 degree angle. Use a variety of materials to create an interesting and textured wreath; here, crab apples were added for colour and rosemary for scent and texture. 3. Insert additional items, such as orange slices or pine cones on a wire. Before adding the oranges, bundle them together into threes with wire. 4. Finish off the wreath with a generous bow. To make this, first tie the ribbon and then affix with wire. This wreath design is by Georgia Miles from the Sussex Flower School , who runs wreath making workshops from the rural Sussex village of East Hoathly. While it looks like a work of art, this wreath is in fact deceptively simple to make. Every ingredient can easily be substituted for something easier to track down. Use whatever is in the garden and forage for ingredients where possible. 1. Pack your wire wreath ring tightly with moss, secured with floristry wire. Dampen with a spritz of water (this will help keep all the ingredients fresh). 2. After cutting, weave your willow branches around the ring, securing with wire. This isn't supposed to look tidy, but shorten any overly long branches with a pair of gardening scissors or pliers. 3. Once your wreath is wrapped both in moss and willow, you can start poking in other ingredients. Snip off around 8 small pine branches and insert them evenly around the wreath (no need to secure with wire). 4. Do the same first with berried eucalyptus and then with pink and white peppercorns. 5. Finally, fill any obvious gaps with sprigs of velvety sage. This wreath design is by Nikki Pierce of Petal and Grace floral design studio. Her low maintenance floral philosophy is to let nature itself guide the designs, highlighting the natural shape of things. Using unexpected components, such as peppercorns and herbs, her style veers away from the traditional. If you're looking for an alternative to the traditional Christmas wreath, swap your spruce for succulents with this step-by-step guide to a living wreath. You could relegate the traditional wreath to the front door, and have a super stylish living wreath on a mantlepiece or hanging on an interior door. 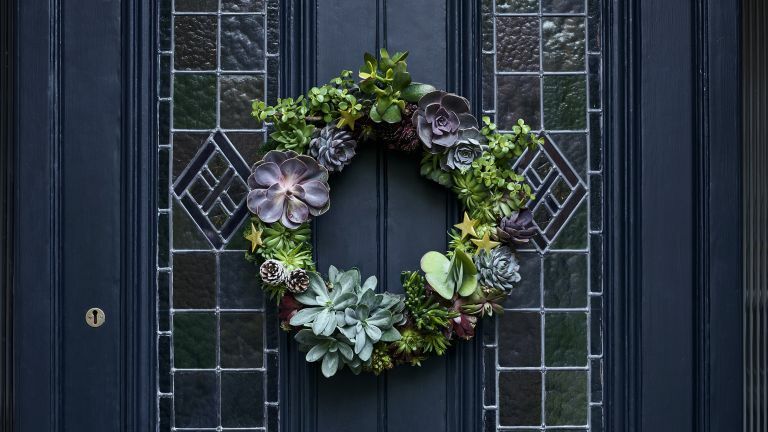 12 plants – if you are going to be keeping your wreath indoors choose a selection of succulents and for outdoor wreaths use some hardy alpine plants like Sedum or Sempervivum. 1. Soak the moss in water (this will make it easier to work with) and cover the oasis ring with it completely. 2. Remove your plants from their pots and start placing these one by one into the oasis ring, securing with pins as you go. Try alternating the types of plants for maximum visual impact. 3. Add a few extra pins to secure your moss around the succulents or alpines, making sure you’ve pushed these firmly into the moss, soil and foam so everything stays in place. To make your wreath extra secure, wrap florist's wire around it to reduce any movement. 4. Add some finishing touches to fill any gaps – pine cones or red berries are great for adding a festive touch. If you’ve opted for an indoor wreath using succulents, make sure it looks its best by watering it once a week. You can do this by soaking your oasis ring in water and using a misting spray if required. For outdoor alpines, depending on position, mist if and when required to keep plants looking fresh. Looking for more Christmas decorating ideas?